Presented by Sponsor: Safety Plus Inc.
Takeaway: An effective safety program is one that is carefully implemented. Workplace safety has historically been an overlooked aspect of company business plans. In recent years, however, organizations have begun to realize how important employee safety and loss control are to the bottom line. But what is safety? Is it random drug tests for employees? Is it a hard hat and a pair of gloves? Is it a hard hat and a pair of gloves…when OSHA shows up for an audit? Sustainable safety management can be a complex endeavor for any company, especially companies that have precise expertise in specific fields that require constant focus. To help companies in their efforts to create a sustainable safety program, we want to share our six key elements of any effective safety program. Perhaps the most critical element of an effective safety program is regular and honest safety audits to identify and correct workplace hazards. Consistent audits are the easiest way to recognize hazards, implement corrective actions, and ultimately prevent worker injuries and their associated costs. As the saying goes, “You can’t expect what you won’t inspect,” and performing regular audits is the best way to prevent costly surprise incidents. These inspections or audits should record hazard details, include photos, identify supervision, and assign corrective actions to specific persons. Lapses in areas such as housekeeping, tripping hazards, PPE use, and machine guarding should be considered violations of a company’s normal business process and addressed immediately upon discovery. To prioritize the correction of more dangerous hazards in a timely manner, assign each hazard a risk assessment level from 1 to 3, based on a determination of its severity and likelihood of causing an incident. Creating inspection checklists specific to the overall worksite or based on Job Safety Analyses (JSAs) can help ensure that supervisors do not miss potential hazards (check out these 4 Steps to Conducting Effective Job Safety Analyses). It is also worth noting that consistent documentation of identification and correction of workplace hazards may prove vital for company defenses in the event of regulatory audits or litigation. Another key element of effective safety management is an established training program for all employees. It is undisputed that workers who are educated about their work environment and how to safely function in their respective roles are more productive and less likely to be injured during their work. The most important aspect of any company safety training program is ensuring that it properly equips and educates employees with the information, protocols, and protections they need to perform their work safely. There are a variety of ways to train employees, including new-hire orientations, instructor-led group training, computer-based training, and toolbox talks (check out these 6 Things to Consider When Planning Tool Box Talks). The most effective training programs use several delivery methods to ensure effectiveness, efficiency, and retention. A good first step is to develop a solid new-hire orientation that introduces employees to the company’s procedures for safe behavior on the job while preparing them for more specific instruction on the worksite. However, one-time new-hire training is not adequate. All companies should invest in sustainable and recurring training that is specific to the hazards recognized in audits and inspections and for tasks employees are expected to perform. One of the items all employees should be trained on is company safety policies and procedures. In order to train on these items, companies must first establish detailed safety policies, procedures, and protocols that are written and authorized by executive management. These policies should be incorporated into the complete HSE process, effectively communicated to the entire workforce, and reviewed and updated, at minimum, on an annual basis. These standards and expectations should be enforced through rewards and discipline programs that do not discourage hazard or accident reporting but inspire workers to operate in the safest manner possible through open communication and in a culture of safe productivity. Unfortunately, no matter how hard a company tries to prevent workplace injuries, accidents can happen. How companies respond to these events, however, says a lot about the effectiveness of their safety program and the value they place on their workforce. Beyond the regulatory requirement to report workplace injuries, there are numerous benefits to properly documenting incidents. Thorough documentation of incident details allows companies to recognize lagging indicators of incidents and address them to prevent future injuries. The truth is that a workplace incident is a strong indicator of a weakness in some aspect of a safety program, whether it be in the company’s procedures, an employee’s training, or a supervisor’s monitoring responsibilities. Consistently recording incident details including specifics of what happened, location, date, time, employees involved, relevant supervisors, and corrective actions needed to prevent reoccurrence will prove beneficial for future improvements to the entire safety program. Incident details should always be reviewed by a team knowledgeable in the task specifics, company procedures, and workplace safety protocols to determine what went wrong and what is to be done to prevent the incident from reoccurring. An effective safety management program is always evolving. 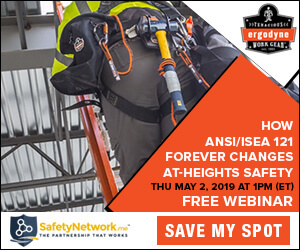 Regular training, safety meetings, job safety analysis, inspections, and accident evaluations are critical, but how does a company keep its program relevant as it grows and changes? How are accidents and property damage trending? Are the metrics better this quarter? Are we meeting our goals? Are more hazards being identified? Are they the same items? Are the same workers identifying them? Is the same supervision responsible for that area? Are our corrective actions effective? Are employee training levels acceptable? Is critical training being completed? Which supervisors are lagging on training? Which workers are lagging on training? Is this okay for now or must it be addressed immediately? To answer these types of questions effectively, a set of acceptable standards must be established. These standards need to be objective, measurable, and trackable and should incorporate both lagging and leading indicators. Incident data is a lagging indicator of a program’s status that allows a company to review past events and implement new protocols to avoid reoccurrence. Leading indicators, such as training completion records and inspection and corrective action data, can help predict concerns before they manifest problems that lead to incidents. Both should be utilized in an effective safety management program. However, these are all factors that cannot be properly evaluated if organizations are not maintaining organized records of training, inspections, and incidents. Measuring key safety metrics is critical as it allows organizations to establish a baseline and improve over time. The previously discussed elements of an effective safety program are all useless without the final element: management commitment to safety. Nearly all companies claim a desire to implement a “culture of safety,” but culture is driven from the top. Unfortunately, the overwhelming majority of upper management teams place a much higher value on production than they do safety. Ironically, production and safety are in no way mutually exclusive goals. All companies should recognize that unsafe work practices can ultimately cost them a great deal. For example, a company that is losing $75K annually due to ineffectual workplace safety measures, must increase sales by $750K to offset these losses (assuming they operate at a 10% net profit margin). A safety department or program must be more than a symbolic gesture; it must be a key component of a company’s overall business plan. Bart Briggs is the founder and owner of Safety Plus, Inc and has actively served as its President and CEO since 1991. The company currently services hundreds of companies across industries including manufacturing, commercial and industrial contracting, trucking, oil and gas, aviation, warehousing, and more. Many of these managed clients have been with Safety Plus for 10, 15, and even 20 years or more, ultimately relying upon Bart’s expertise, and the expertise of the team he has built. More from Safety Plus Inc.
How often should our organization hold safety meetings? What is the best way to integrate safety data across multiple platforms? How do we organize and conduct an initial safety audit of our facility if we don't have a Certified Safety Professional on staff? Should the risk of future, repeat OSHA citations figure into my company’s decision to contest a citation?